Studies of stock structure in Chinese waters are ongoing (Gao et al., 2013) but there are indications of separation of a stock in the East and South China Seas from another in the Yellow Sea (Lu et al., 2011). Nomenclature is unresolved but O. fangsiao (=Octopus ocellatus), referred to as shortarm octopus in Chinese literature, appears to be the same species (O. membraneceus) FAO names webfoot octopus (Roper et al., 1984). However, webfoot octopus is no longer accepted and is now considered as the Amphioctopus membranaceus species (gold-spot octopus) (MolluscaBase 2019) . Some technical management measures are in place. MPAs are established to protect ETP species, some with fishing restrictions. No species-specific stock assessment is conducted. No scientific advice is known to exist. There is little information available on stock assessment and environmental impacts but it is unclear if this is due it not existing or to it not being made public. The effectiveness of the current management measures is unknown. Illegal fishing is known to occur despite no available and official data. The structure of the stock in Chinese coastal waters has not yet been determined but some progress has been made. No coast-wide stock assessment for the species is known to be conducted. Results of stock assessments for all octopus species in the South China Sea have been presented at regional workshops, with results from 2009 available (FAO, 2010) but it is unclear if they resulted from a yield per recruit model or expert judgment. No formal scientific advice is made public. No reference points are known to be defined for assessment or management of the resource. Recent changes to management for the South China Sea were assessed as an example of a data-limited ecosystem approach to fisheries management (Ye et al., 2011). There are no specific studies of stock status but sampling in several coastal regions have recorded decreases in mean size and earlier sexual maturation (Li and Huang 2011) (Huang 2008) . 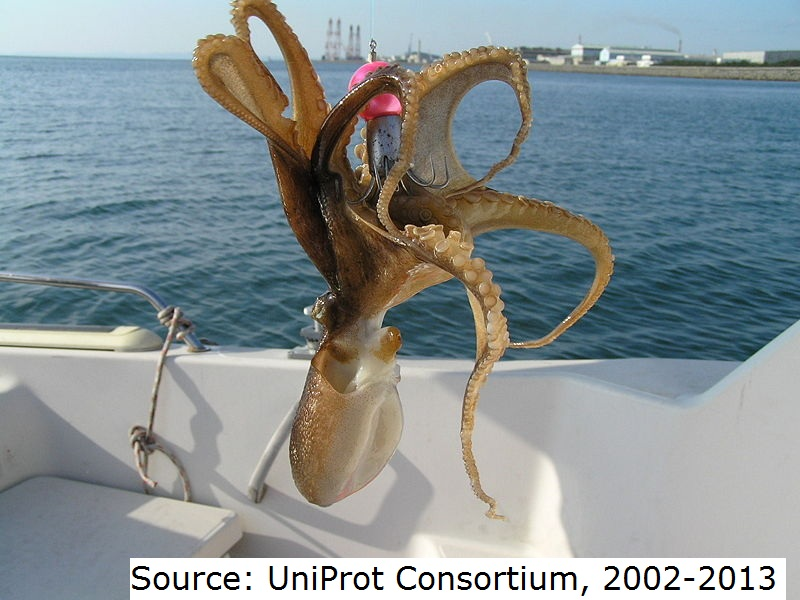 There are also reports of reductions due to intense fishing (Yang & Wang, 2009) and an assessment of Octopus spp. in the South China Sea noted that the resource was depleted overall, with decreasing short-term catch and survey index trends and the fishery was judged to be over capacity (FAO, 2010). Catch data for octopus not identified to species level in Chinese waters is limited, but an increasing trend may be occurring. Chinese fisheries are managed by the Bureau of Fisheries (Fisheries Management and Fishing Port Superintendence Bureau of the Popular Republic of China) under the Ministry of Agriculture, in coordination with the Bureau of Fishing Vessel Inspection, the National Fisheries Technical Extension Station and the China Academy of Fisheries Science; divisions at the province level are also responsible for law enforcement (FAO 2001) . In the result of an overfishing situation, a system control on fishing licenses (general, special and temporary) was established in 1979. Fishing zone regulations control fishing gears restrictions in certain areas: prohibited fishing lines along the 50m depth contour for trawling, light purse seines and entangling nets. Fish bycatch limits are set (Kang 2006) (Mu et al. 2007) ; four summer fishing closures with different time periods and gear bans were established since 1995 in the East China Sea (and the Yellow Sea) and in the South China Sea since 1999 (Cheng et al. 2009) (Ou and Tseng 2010) . The “Double Control” system limits the number and power of boats (Watson et al. 2001) . (Nordquist 2008) mentions the important role of national and regional Chinese regulations and institutions to improve control and compliance. Zhangyuanyuan (undated) considers the “Double Control” system as an invalid management measure. Species identified as endangered, threatened or protected (ETP) in the region include Indo-Pacific hump-backed dolphin Sousa chinensis, classified on the IUCN Red List as Near threatened and decreasing (Reeves et al., 2008), finless porpoise Neophocaena phocaenoides, classified as Vulnerable and also decreasing in trend, and for which bycatch in trawl and seines is in general reported as being intense (Wang & Reeves, 2012). False killer whale Pseudorca crassidens is reported as bycatch in Chinese coastal fisheries but its status on the IUCN Red List is Data Deficient (Taylor et al., 2008); the western subpopulation of Gray whale Eschrichtius robustus is classified as Critically Endangered but is reportedly increasing in size (Reilly et al., 2000); Hawksbill Eretmochelys imbricate (Mortimer & Donnelly, 2008) and Leatherback turtles Dermochelys coriacea (Sarti Martinez, 2000) are both Critically endangered and decreasing, and green turtle Chelonia mydas is classified as Endangered and also globally decreasing (Seminoff, 2004). A Red List of endangered Chinese species is published and the horseshoe crab Tachypleus tridentatus and Chinese spiny lobster Panulirus stimpsoni are considered to be endangered due to overexploitation (Liu, 2013). No data on either direct or indirect impacts on PET species due to the fishery could be located. No information on bycatch species or rates could be located, but trawling may result in high bycatch rates (Rathjen 1991) . No information on bycatch species or rates could be located. Non-target species need to be unconditionally released (MofA, 1993). No studies of impacts due to the trawl fishery could be located but adverse impacts on benthic habitats are generally produced by bottom trawling (Rathjen 1991) . Knowledge of habitat types has been expanded considerably in recent years (Cheng et al., 2007; (Liu 2013) . Artificial reef installation has been a management strategy employed for several decades in Chinese coastal areas and potential benefits to octopus are under study (Tang et al. 2009) . Marine Protected Areas (MPAs) are established both at the national and regional level, with 15 of the former and 26 of the latter currently in place. In many cases, MPAs are constituted of different zones, with fishing outlawed in the “core” zone. One of the intended purposes is to protect vulnerable species’ habitats. Fishery protected areas have been established in the East China Sea to protect important commercial species’ habitats and additionally, trawl, light purse seine and entangling net fisheries are not permitted at depths shallower than 50 m (Cheng et al. 2009) . Closed seasons are defined by gear type in both the South and East China Seas (Cheng et al. 2009) (Guo et al. 2008) . No studies of impacts due to the seining fishery could be located. Knowledge of habitat types has been expanded considerably in recent years (Cheng et al. 2009) (Liu 2013) . Ecosystem modeling has been conducted and concluded that overfishing has led to significant shifts in the East China Sea ecosystem (Cheng et al. 2009) (Li and Huang 2011) (Li and Zhang 2012) . In the result of an overfishing situation, a system control on fishing licenses (general, special and temporary) was established in 1979. Fishing zone regulations control fishing gears restrictions in certain areas: prohibited fishing lines along the 50m depth contour for trawling, light purse seines and entangling nets. Fish bycatch limits are set (Kang 2006)(Mu et al. 2007) and four fishing closures are in place. A “Double Control” system limits the number and power of boats (Watson et al. 2001). However, the status of the stock is unknown thus the effectiveness of the management measures is unknown. There is no available official data about compliance by fishermen on the management measures in place. The status of the stock is unknown. No formal assessment is known to be conducted. No data apart from catch data is available so no scores can be determined, being all determined as Data Deficient. Landings are for all unidentified octopuses caught by China in the Northwest Pacific (FAO major area 61) and values for 2003-2006 are FAO estimates (data from FAO, 2003-2016) (FAO 2019) .